Your Implant Dentist Talks About Bone Grafting — When Is It Necessary? Getting dental implants is an important step for anyone who wants to replace their missing teeth in the best way possible. However, the implant process is complex, and in order for it to be successful, a bone graft is often necessary. 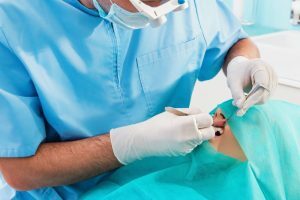 Your implant dentist in Marietta, OH is here to talk about this important procedure and the reasons behind it. In order for dental implants to have the support they need, it’s important that your jawbone is strong enough and large enough to keep them in place. Your implants will bond with your bone, but if there isn’t enough bone to bond with, your new teeth will fail. That’s where bone grafts come in. An oral surgeon may use artificial bone, your own bone from another part of your body, animal bone, or donor bone to make up for your jaw’s deficiency. The last reason is the most common factor that leads to the need for a bone graft. Losing your natural teeth automatically leads to bone loss. That’s because the bone in your jaw is designed to support your teeth, but when there are no pearly whites to keep in place, the bone begins to atrophy. Also, chewing keeps the bone strong, but if you’ve lost a significant number of teeth, you may not chew with the same vigor that you once did. Bone loss in the jaw begins immediately after tooth extraction. Therefore, even if you decide to get an implant soon after a tooth extraction, a bone graft might still be necessary. How Does a Bone Graft Fit Into the Implant Timeline? Your oral surgeon in Marietta, OH will discuss your implant journey with you from its start to its end. The entire process may take up to a year for some patients, especially if a bone graft is involved. If this step is necessary for you, your jaw and gums may need time to heal before you receive your implants — typically, this healing period lasts for four to six months. In other cases, though, it’s possible to do a bone graft at the same time your oral surgeon is placing your implant. If you find out that you need a bone graft, there’s no reason to despair. The procedure is painless, and your oral surgeon has lots of experience with it. Thinking about getting dental implants? It’s possible that a bone graft is in your future as well. Dr. Jeff Lee specializes in oral surgery. He has helped countless people enjoy the benefits of dental implants, and he would like to help you too! If you are interested in a consultation or you have questions about bone grafts, please contact our Marietta office at 740-236-9392. Comments Off on Your Implant Dentist Talks About Bone Grafting — When Is It Necessary?